Now when you upgrade to a qualified heating system, you can apply for On-Bill Financing and receive an affordable loan. Energy Trust is working with Portland General Electric, Pacific Power, and regional nonprofit lender Craft3 for this special offer. This special financing is only available to customers installing qualifying energy-efficiency upgrades with Energy Trust trade allies. In addition, you may also be eligible for incentives on your home energy improvements through the Energy Trust of Oregon. 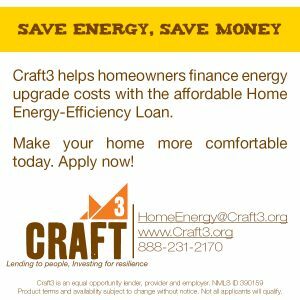 Craft3’s Home Energy Loan allows qualified applicants to finance improvements to their home energy systems and pay the balance back in monthly installments included with their monthly utility bill. Loans up to $10,000 with low fixed rates, 6.89% APR or 7.39% APR, and low monthly payments. Applicants who pay their utility bills regularly may be eligible for a loan even with a less-than-perfect credit score. *Insulation projects are only eligible for On-Bill Repayment when installation is combined with a qualifying heat pump upgrade. Insulation projects are not eligible for On-Bill Repayment when installed in condos and townhomes. APPLY FOR THE CRAFT3 ON-BILL FINANCING PROGRAM HERE.